First rule in comics: You only have fame for so long before Batman steals it back. Case in point, Groot stole the hearts of the public in 2014's film Guardians of the Galaxy. Now that the bark-skinned hero is riding high, comes Thomas Earing's AMAZING tree sculpure of DC's Dark Knight to show everyone how the iconic hero's timber never dates. Let's see Poison Ivy wrap herself around this! Taking about thirty hours to chainsaw, sand, chisel, oil and pray against an attack from the termite League of Assassins, this squatting Batman may be missing his infamous gargoyle perch, but at 7-feet tall, he's intimidating all the same. 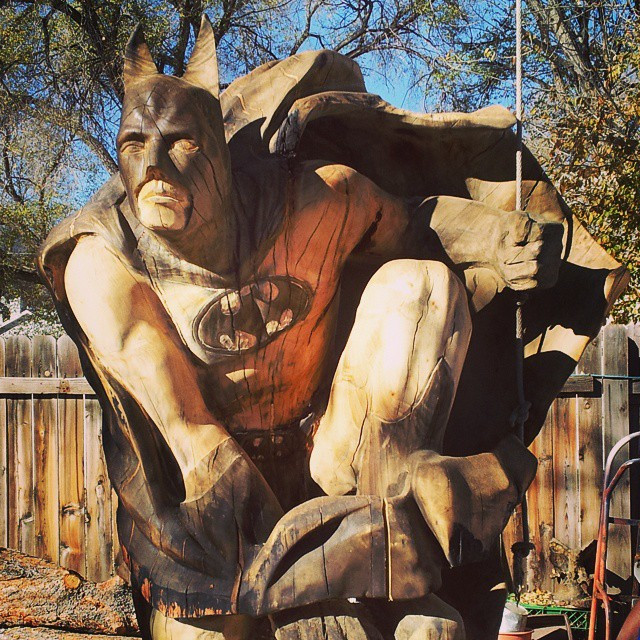 Made from 'recycled trees' that have fallen down in storms or are removed by homeowners, the Seattle based chainsaw artist / sculptor has been hard at work on his craft for over 12 years now, and hopes to sell the timber carved Batman on his website to some lucky fan. Sorry Groot, no word on if you're joining the line-up just yet. That, and the Groot swing, are in the backyard of my revisionist childhood. Very, very cool. Id still use this for firewood though. Suddenly Random, I picture the courtyard in The Lion, The Witch and the Wardrobe, but instead of concrete statues there's wooden comic heroes - with which I am perfectly fine with - as long as there's a stone Darkseid. That would be the only exception. Dale, that's fine, just burn the worst characters first okay. Like Dr Druid. No one will miss that dude. You know, our interconnected back yards would rock.